Tick, tock, tick, tock. Only three weeks until we head to New York! Week 7 training went smoothly and I tried a new workout. Usually I just go out a log the miles, but lately I have been thinking about what I can do to improve as a runner and prepare to attempt a half marathon PR. After each 800, I did a 400 recovery. After doing some research, I found a treadmill cheat sheet that will help me pick the right speed to challenge myself a little more with my pace the next time. Thursday: It was a tension-building day at work, so by the time we laced up for our six mile out & back run, I really needed it. 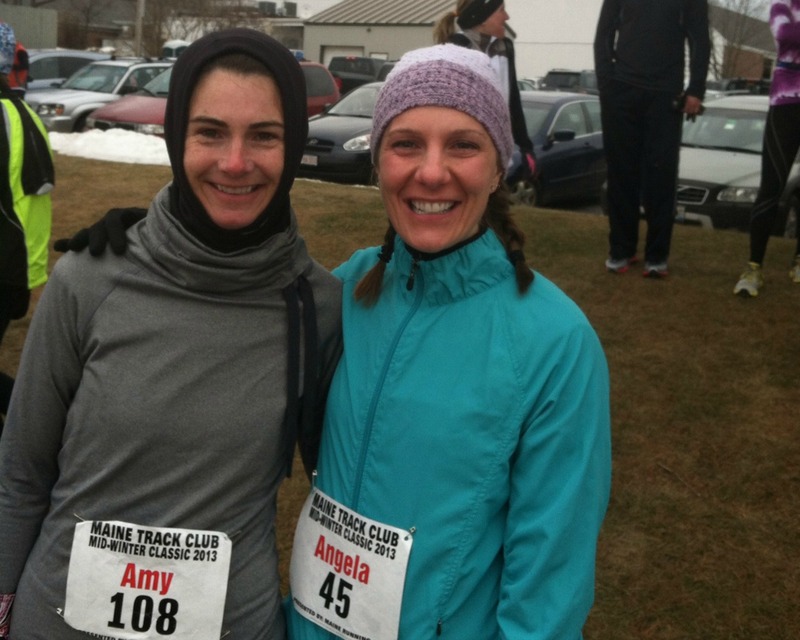 What I didn't need was the strong headwinds and an obstacle course of snow & icy sidewalks. Usually I worry about my pace and going too fast, but the conditions forced me to focus on my running. Surprisingly we finished with a negative split. Saturday: This week we followed the Manchester half marathon course for our long run. The hills were challenging and we kept getting caught at stoplights, but the overall pace was good. According to the McMillan Running Pace Calculator, my pace during long runs should be between 10:09 - 11:23. 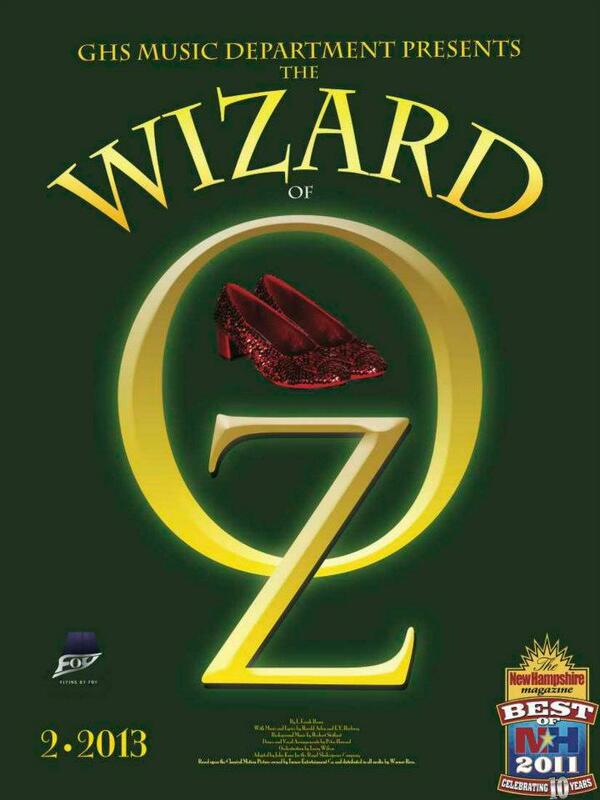 The high school where I work is performing The Wizard of Oz. Last Saturday evening two of the kids, my husband and I went to see it. It was an amazing show and the student talent is out of this world! Now, I'm not writing a musical recap, but the theme There's No Place Like Home has stayed with me since that night. It has been seven months since I was home to see my family and friends. Naturally, I miss them. In May I will be going home to Cincinnati for a quick weekend visit and to run the Flying Pig Half Marathon. Even though I lived all those years in Ohio, I never participated in this event. 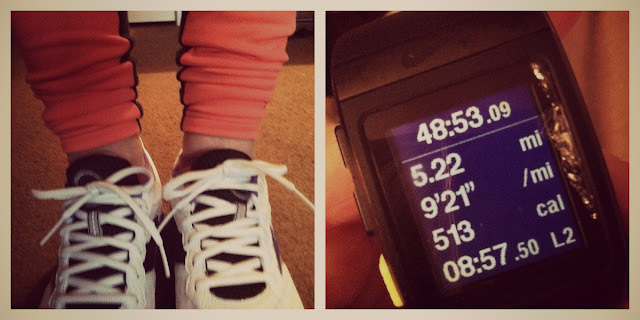 My running adventures started about two years before I moved and they were small. My "big" race back then was this 10K and nothing at all like the 13.1 mile course I will be facing. I love that I can combine running with a family visit. Unfortunately, my dad no longer lives in Cincinnati, so I have to make a trip to Florida to see him (yes, I HAVE to!). Lucky for me, that trip starts on Monday. Do you ever combine travel, family, and fitness? That is the best way to describe last week. Between work, kids, sporting events, and appointments, it is nothing short of amazing that I was still able to get in all of my workouts. I'm feeling good about my running base - my average run distance is 6 miles. It's the long runs that always worry me. I have a tendency to go out too fast and run out of steam at the end. My goal is to train better so that I can finish stronger and feeling good. I'm planning to try some of the workouts mentioned in this Runner's World article. #TrainingTruth: I'm never too busy to run! Tuesday: 6 slushy miles. Cleanup from the blizzard was still a work in progress. The roads were in great condition, but the sidewalks were hit or miss. We made it out and back on our normal route, but we had to jump on the road at times. Thursday: 6 mild miles. Sidewalks were in better shape and the mild 40 degree temperatures were helping. It was a capris day, but my shoes still ended up soggy from the slushy puddles along the route. Saturday: 11 smoothie miles. Winter weather greeted us again with 2+ inches of fresh snow, but we had already planned to run downtown knowing that the sidewalks would be in better shape and the roads are wider. It was challenging at times, but this was a good long run. Afterwards we enjoyed a delicious post-run fruit smoothie with a shot of protein. How do you train for a strong finish? On Sunday my husband, my running partner, and I ran the inaugural Snowflake Shuffle in Bedford, NH. The weekend blizzard did not keep Millennium Running from putting on another fantastic, new event. Once again Millennium Running had a sold out event. Check-in for bib and hoodie pick up opened at 8 AM for the start at 9:45. Despite more than two feet of snow falling less than 24 hours prior, the race site was in good condition and ready with the staple tents, pace markers, and port-a-potties. Hundreds of runners were willing to brave the 14 degree weather, and at exactly 9:45 the organizers sent us on our way. The out and back course was mostly flat with one short challenging climb up a cul-de-sac just passed mile two. 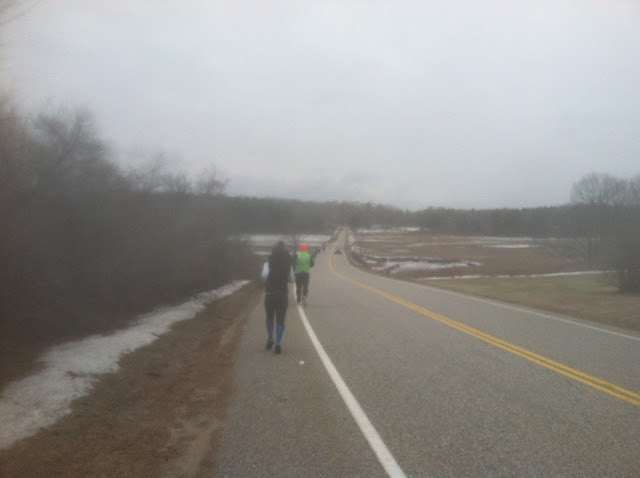 The city of Bedford provided police detail along the nicely plowed, closed roads, a few spectators braved the cold and sprinkled the course, and water was provided halfway for those that worked up a thirst. The $30 registration fee included an awesome hoodie and post race pasta, bread, cookies and beer provided by the title sponsor and local restaurant, The Copper Door. Friendly faces served up plates of food and solo cups of Sam Adams. For runners like me who hate to wait for official results, MR offered instant, personalized results at the finish line displayed on 2 flat screen TV's mounted on the Millennium Running Timing Trailer. All runners needed to provide was the bib number. You would never know that this was the first running of the Snowflake Shuffle. 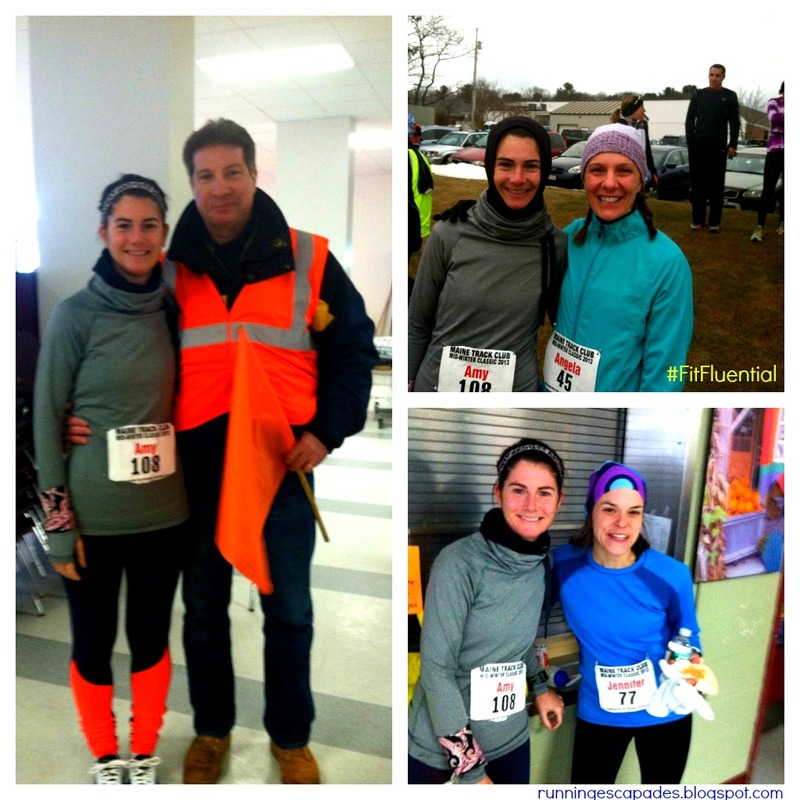 Millennium Running did a flawless job organizing the inaugural event especially in light of the historic nor'easter. They even went the extra mile by arranging shuttles for runners forced to use overflow parking lots when mountains of snow encroached on space. This 3 mile fun run was not the first inaugural event that I have been to. Surprisingly, I have been to many. My first half marathon was also Providence's first Rock-n-Roll event. I was part of the first run across the Pell Bridge in over 25 years and I joined over 2000 Santa's running down Elm Street. 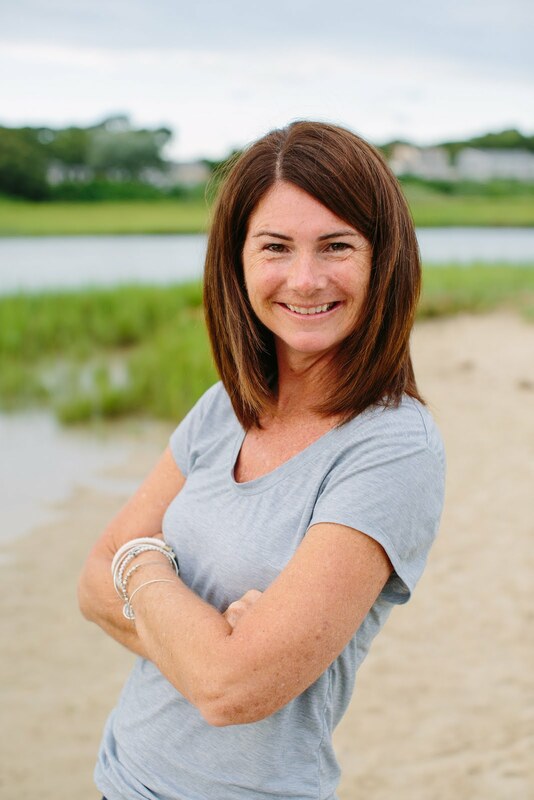 Last fall I helped kick off a new Cape Cod race as a ZOOMA ambassador. Have you ever participated in an inaugural event? How was it? 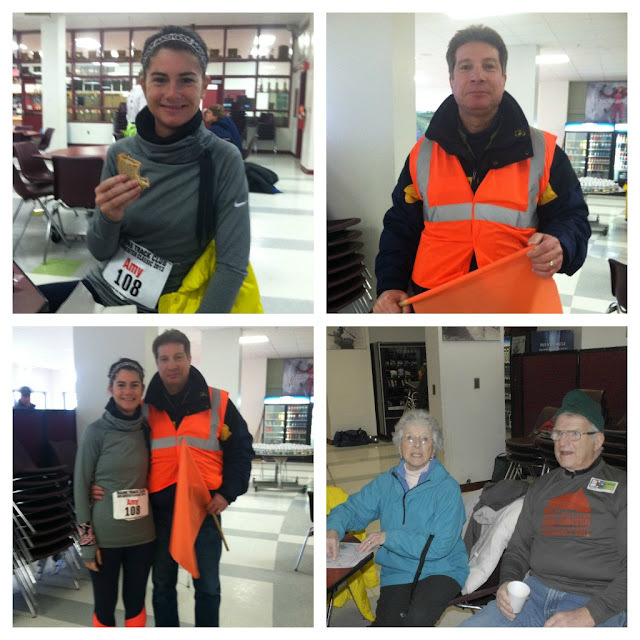 Last week I continued my training for the New York City Half Marathon (just 5 weeks away) and participated in another fun run with family and friends. It was a week of cold and sometimes snowy weather, but I managed to complete my training runs with a little creativity. I received a lot of positive feedback about the Chilly Challenge. Thank you for letting me know that you had fun, were motivated, and pushed yourselves to run more than ever. #TrainingTruths: It's cold - run anyway! For Tuesday's run, I asked Daisy if we could do 6.1 instead of our usual 6 miles. 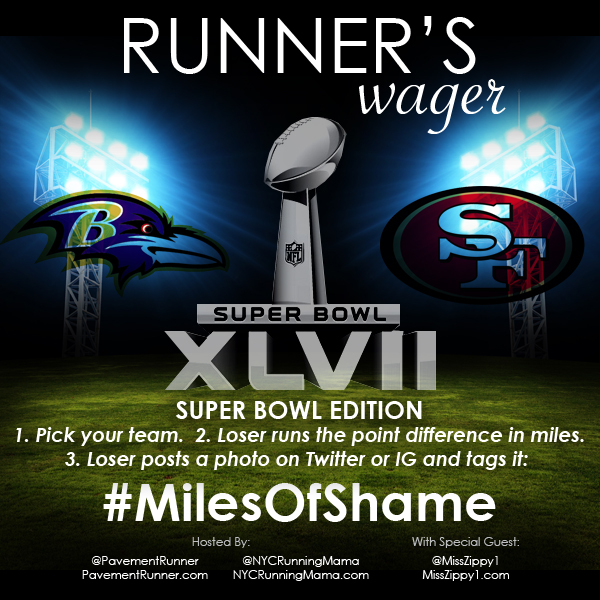 I owed 3 #milesofshame to the Runner's Wager Super Bowl Edition and I signed up for Kyle's Krusade Virtual 5K, a fundraiser benefitting the Talbert Family Foundation to help defray the medical costs for families with children fighting cancer. Thursday, feeling the need to change things up, we did our old hill route. This one starts out with a relatively flat 1+, but then starts climbing steadily (and sometimes steeply) for 2 miles. Once we make it to the top though, we are rewarded with a mostly downhill finish. When it feels like 16 degrees, I should wear more than my no-show socks. Cold ankles on this one. Maybe wearing compression socks like the one's mentioned in this Runner Click article would work. On Friday I couldn't resist taking a little birthday pre-blizzard run with the dog. It was just to the local pond and my husband followed in the car taking some great pictures. Although we didn't see other runners, I could see shoe prints from someone who ran the out and back before us. Our normal Saturday long run was snowed out, so we had to reschedule. Since we were running the Snowflake Shuffle, a three mile fun run, on Sunday, we decided to meet early and do a few pre-race miles. At 12 degrees, my toes were cold until about halfway through a pre-race warmup. How did the weather affect your training last week? There are some people who know you almost better than you know yourself. My MOM is one of those people. She recently sent me my new favorite running shirt. 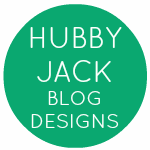 Now, you might be thinking big woop! Of course your mom knows you like to run. But it's not just that she knows I like to run; she knows that I need to run. I need to run for ME. Thanks Mom! I love the comfort and casualness of sweatshirts. But I don't always like the bulk. A few months ago I was browsing the Athleta catalog and saw the perfect solution: the Olema Pullover. I waited until I had a coupon, a rewards discount, and a gift card to order it. Yesterday my husband said, You really like your new top, don't you? Yes, I might be wearing it that much. After dealing with a tender hamstring, I've been trying to strengthen my hips to prevent another injury. 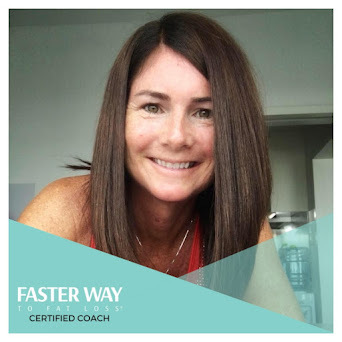 Earlier this week Cheryl posted Strengthening your Hips: Runner's Injury Prevention which highlights some exercises using bands that will have your "hip flexors screaming." Meet my new favorite workout tool. At the end of the year, runners automatically start planning ahead and I am no different. With my name in the lottery for NYC in March and Half at the Hamptons as a back up at the end of February, I knew I would be doing some long runs in January and February. So in November when I read about the Mid-Winter Classic 10 Miler in Cape Elizabeth (outside Portland), I couldn't pass it up. Only a 2 hour drive from our little piece of the world in NH and a match with my training schedule, made this small local race a great choice. Early registration was only $20 with a shirt purchase optional (love that), making it easy for me to justify why we should do a little get-a-way to Maine. And I could add another New England state to the list of places I have run. 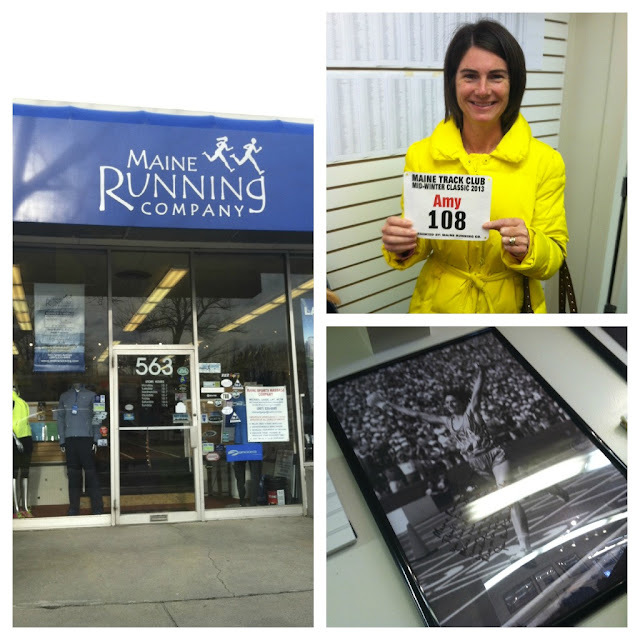 Our first stop on Saturday afternoon was the Maine Running Company for bib pick up. It was easy to find and there were plenty of staff/volunteers ready to help. After a quick look around and a small purchase of some NUUN, we were on our way to play tourists in Portland for the evening. We arrived at Cape Elizabeth HS, just a short 10 mile drive from our hotel, before 8 AM on Sunday. My husband was volunteering on parking lot duty until 9:30, finishing just prior to the 9:45 start. While he was working, I had a bite to eat and chatted with some friendly water stop volunteers. It was a cold day for a 10 miler so I was all layered up in my LuLu runder unders, nike pro thermal, and LuLu brisk run neck warmer. I also brought along my running gloves (which I almost never wear). My plans to hang out with Jen and Angela before the race didn't happen, but I did snag Angela as she was walking to the start line. After a quick chat about pace before the BOOM of the cannon start, we were off and running. I was able to keep up with her for about a mile and a half, but sent her on so as to not hold her back. 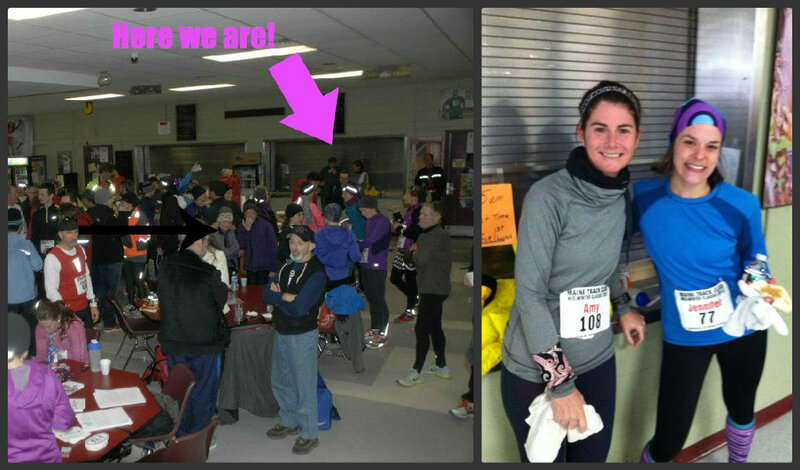 Once I caught my breath, we headed into the HS cafeteria to warm up and grab some of the post race food. We hung out off to the side for a bit and then Jen and I finally connected right before we left. The race offered the use of locker rooms and showers (which I thought was nice), but I had a big hotel shower with my name on it. I went into this race hoping to beat my Black Cat 10 Miler finish time from last winter. I missed it by a little less than a minute. I know every race can't be a PR. I know this course was mildly challenging. I know that it was 22 (but feels like 13) degrees at the start. I know that a 1:30:12 finish time is respectable. I know I'll be looking for a PR rematch in a couple of weeks at the Black Cat 2013. How do you feel about PRs? What a wacky week of weather we had last week here in New Hampshire. Over a four day period we had a little snow storm, some freezing rain, heavy fog, torrential rain, and crazy wind gusts. It might be annoying, but it doesn't stop me from lacing up my running shoes. #TrainingTruths: Wearing new gear makes you feel fast! Tuesday I was too chicken to run on the snowy roads by myself so I did a treadmill progression run instead. My new Wave Rider 16s definitely help my motivation and because they're so soft and comfy, I felt like I was flying! Thursday's wind advisory run went a lot better than I expected. First I wore my new Runder Unders and they felt so light and soft on my legs...wow! Then, despite the 20+ mph wind gusts in our faces on the way out, we kept a really happy pace on the way back after a stretch break at the turn around. My NYC training plan had a ten miler scheduled for my long run this week, so waking up in Maine on Super Bowl Sunday for the Mid-Winter Classic worked out perfectly. While my husband volunteered for parking lot duty, I went for a run with some friends. Once again I entered the Runner's Wager sponsored by Pavement Runner and NYC Running Mama. Last time I had to run 15 #milesofshame, so this time I capped at 10. At first I was thinking, best. decision. ever, since I went with the 49ers. Luckily the lights came on after the lights went out, and I only owe 3 #milesofshame this time. I loved the success of the Chilly Challenge, so this month I've joined Janine's #5050February Make Your Miles Matter Challenge. It's another mileage challenge, only this time the prize is CASH! How was your week? Any new fitness activities in your schedule? First, Let me say that EVERYONE who participated in the challenge is a WINNER! In 31 days, 288 people logged a combined 20,643.59 miles! That is incredible! Congratulations to all of the Chilly Challenge participants. You all rock! We will be announcing individual prize winners soon! Thank you to all of our awesome sponsors! I hope everyone had fun, found motivation, and was inspired to challenge yourself even more! 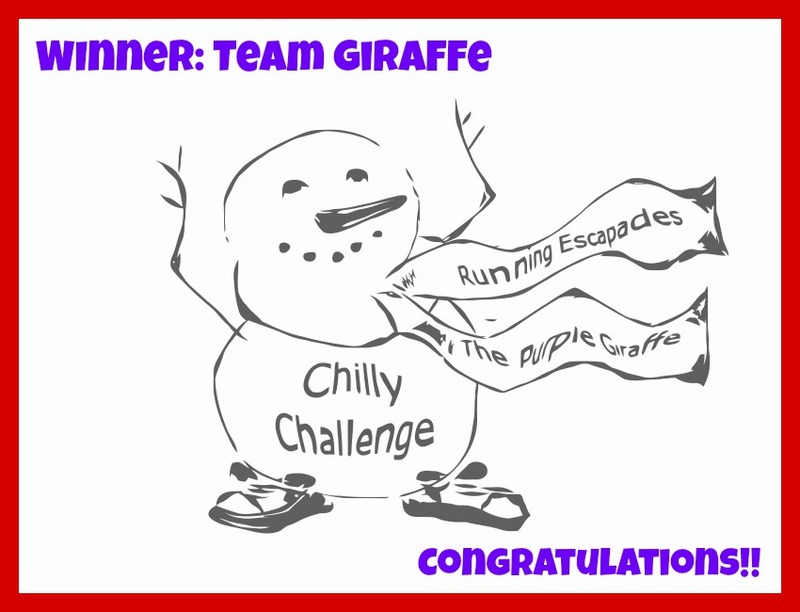 Did the Chilly Challenge help you toward an accomplishment?